Clinical trials are indispensable for driving cancer treatment discoveries; however, clinical trial accrual and retention remain significant challenges, particularly in minority and underserved communities. Social media is having a paradigm-shifting effect on clinical trials by facilitating cross-cutting, multi-directional communication among patient, advocate, researcher, and clinician communities. NCI has played an active role in developing social media strategies for clinical trials. 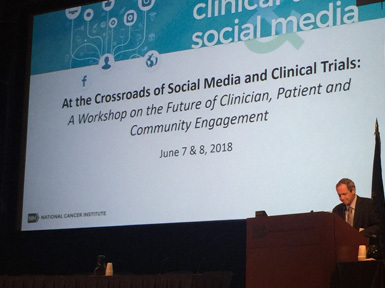 To further explore strategies by which social media may engage diverse stakeholders in cancer clinical trial communities, NCI convened a workshop on June 7-8, 2018 (agenda) entitled, “At the Crossroads of Social Media and Clinical Trials: A Workshop on the Future of Clinician, Patient and Community Engagement.” Both days of the workshop are available to view via NIH Videocast (Day 1 and Day 2). 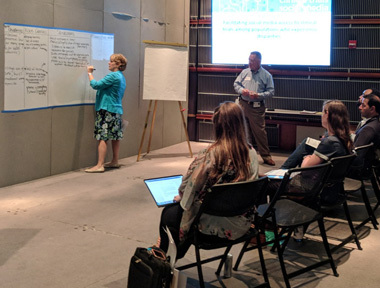 During the highly interactive meeting, attendees discussed approaches to engage and educate the public and health care providers about cancer clinical trials using evidence-based social media strategies. The Attendees and 38 workshop speakers included patient advocates, clinicians, representatives from NCI’s National Clinical Trials Network (NCTN), ethicists, and digital communications experts. Speakers provided their perspective on the relationship between clinical trials and social media, as well as guiding principles for the attendees to consider during the breakout sessions. NCI and the Cancer Moonshot Network for Direct Patient Engagement sponsored the workshop, and staff from NCI’s Division of Cancer Treatment and Diagnosis, Division of Cancer Control and Population Sciences, and Office of Communications and Public Liaison planned the event.